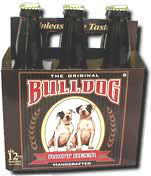 Wholesalers, are you interested in selling Bulldog Root Beer? We're a proven seller in the areas where we are currently distributed. Feel free to call any of the following wholesalers and ask for a reference. We're a good supplier and we're happy to work with you. Please contact us by email for more information. Are you trying to buy some Bulldog Root Beer? If you see a Wholesaler in your area, but you didn't see any Retailers near you, call the Wholesaler and ask where they distribute Bulldog Root Beer.